Many thanks to our sponsors, who appreciate the considerable effort of this project! JUMP! - BACK TO ROCK! 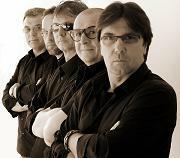 The extremely authentic RETRO-COVER-ROCK-BAND from Nuremberg.